Dudjom Sangye Pema Shepa (b. 1990) is a reincarnation of Dudjom Rinpoche and resides mainly in Tibet and Nepal. Dudjom Sangye Pema Shepa was born in 1990 in Jyekundo in Kham, Eastern Tibet (Yuesue County of Qinghai Province in China), as the grandson of Dudjom Rinpoche. His father is Dola Tulku Jigme Chökyi Nyima Rinpoche, Dudjom Rinpoche's own son (and younger brother of Thinley Norbu Rinpoche). His mother is Pema Khandro. Oral stories recount that before Dudjom Rinpoche passed away, he mentioned that: "I will go to China, and I will be reborn into my own family." He was reborn exactly as predicted. When Dudjom Sangye Pema Shepa Rinpoche's mother was three months pregnant, one day she saw a rainbow over their house and she knew that it was an auspicious sign. Since then, many rainbows have appeared to them, and some even appeared inside their room. After Dudjom Sangye Pema Shepa Rinpoche was born, many great lamas of different traditions came to see him. Some said that he was a tulku of the Sakya lineage, while others said that he might be a tulku of the Gelug. Dudjom Sangye Pema Shepa Rinpoche was first recognized as the tulku of Dudjom Rinpoche by the great tertön and wisdom dakini Tare Lhamo, the daughter of the great tertön Apang Tertön in Golok. The prophecy came to her in poems of dakini scripts, which she translated into Tibetan. Later on, Dudjom Sangye Pema Shepa Rinpoche was also recognized as a tulku of Dudjom Rinpoche by Khenpo Jikme Phuntsok and Dzongsar Khyentse Rinpoche, who held an elaborate ceremony in Dzongsar Monastery. He also met Namtrul Rinpoche when he was young. Dudjom Sangye Pema Shepa was also recognized as an incarnation of Dudjom Rinpoche by Chadral Rinpoche, Thinley Norbu Rinpoche and Minling Trichen Rinpoche. In 1994, the enthronement ceremony was held in Nepal by Chadral Rinpoche, which gathered many students of Dudjom Rinpoche, including Penor Rinpoche, Dzongsar Khyente Rinpoche, Shechen Rabjam Rinpoche and Katok Situ. While in Nepal, Dudjom Sangye Pema Shepa also met Katok Ontrul Rinpoche, Katok Situ Rinpoche, Katok Moktsa Rinpoche and Loga Rinpoche. In Serta, Tibet, Dudjom Sangye Pema Shepa visited the Chakhyungtsang descendants of Dudjom Lingpa, including Khandroma Kunzang Wangmo. He also visited Semo Dechen Yudron and Chonyi Rinpoche in Central Tibet. Dudjom Sangye Pema Shepa also visited many other sacred places like Samye, Gangri Thökar, the hermitage of Longchenpa, and Mindroling Monastery. The ceremony of initiating Dudjom Sangye Pema Shepa’s education was performed by Chadral Rinpoche himself, who later taught him reading and writing. Penor Rinpoche, who gave him all the transmissions of the Nyingtik cycle, as well as Jetsun Putsuk and Nyingtik Yabshi. Chatral Rinpoche taught me the Tibetan alphabet himself, from beginning to end. After that, I had many lamas, […] many great teachers, but definitely a single root lama, Chadral Rinpoche. […] I have followed exactly everything Rinpoche told me to do. He told me it might be difficult going to the West, and that is why I have not gone yet. He told me to do the ngöndro practices and right at that moment, I made the commitment that I would do them and I did both the Dudjom Tersar ngöndro and the Longchen Nyingtik ngöndro. After that, Rinpoche advised me to do a 3-year retreat at Gangri Tokar and practiced the lama, yidam and dakini practices from the Dudjom Tersar fully for three years. I have done absolutely everything I could to fulfill whatever Rinpoche asked me. First one is Tertön Dudjom Lingpa himself transmitted to his eight sons and heart disciple Gyurme Ngedön Wangpo, to Dudjom Rinpoche, to Gojo Orgyen Chemchok, and he conferred to me. Second one is from Dudjom Lingpa himself to his son Tulku Dorje Dradül, to Chadral Rinpoche, from whom I received the complete practice manuals and Dzogchen teachings. Third one is from Dudjom Lingpa himself to his son Tulku Trimé Özer, to Dzongter Kunzang Nyima , to Tulku Theglo Rinpoche, from whom I received entire empowerments, including Dharmapala life-entrustments. Moreover, I also received empowerments and important major teachings of upper and lower Dudjom Tersar from Thinley Norbu Rinpoche, like Secret-seal Heart Practices, Three Roots practices, Dorje Drollö and Vajrakilaya etc. Transmission lineage is like that. Dudjom Sangye Pema Shepa resides mainly in Nepal and often visits Tibet. Dudjom Sangye Pema Shepa has done pilgrimages in many sacred places such as those in the area of Mount Kailash, those in Ü-Tsang, those in the upper and lower Kham region, Wutaishan in China, as well as places in Nepal, Bhutan and India. In 1997, at the request of Chadral Rinpoche, Dudjom Sangye Pema Shepa granted his first empowerment at Nyeshang Monastery, near the great naturally arisen stupa in Nepal. The empowerment was a long-life empowerment by means of the Dudul tshe dkar cycle. Then, at the request of the masters and students of Zangdok Palri monastery in Kalimpong, India, Dudjom Sangye Pema Shepa presided a tsok ceremony based on Vajrakilaya Namchak Pudri, a combined terma of his precedessor Dudjom Rinpoche and of Dudjom Lingpa. At Jangsa Monastery in Kalimpong, Dudjom Sangye Pema Shepa presided in a tsok ceremony based on the kama lineage of the Nyingma, and he conferred the empowerment of the Tsokye Tuktik. He also visited many monasteries and hermitages, including the monastery of Chadral Rinpoche in Kalimpong. 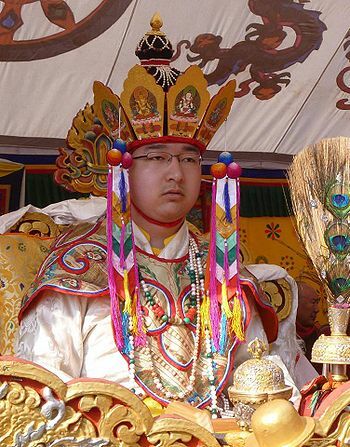 In 2004, during the anniversary ceremonies commemorating the passing of Dudjom Rinpoche, and at the request of Dudjom Sangyum Rigdzin Wangmo, Dudjom Sangye Pema Shepa spent one day presiding over a drupchen of Vajrakilaya Namchak Pudri at Orgyan Chokhorling, the residence of his predecessor Dudjom Rinpoche. Then, Dudjom Sangye Pema Shepa was invited by Dungse Garab Rinpoche, son of Thinley Norbu Rinpoche, and by Lopön Nikula and others to visit the whole of Eastern and Western Buthan, including Rangjung Osel Chöling , Bartsham, and Yonphu Monastery. Dudjom Gompa, where are instated the sacred remains of Dudjom Rinpoche. In Tibet, at the request of Karma Kuchen Rinpoche, Dudjom Sangye Pema Shepa visited the original monastery of Palyul and presided during the consecration of the newly built temple and its sacred contents. He also visited the original monastery of Thubten Dorje Drak, and performed the consecration for the newly images. In India, at the request of Minling Trichen Rinpoche, Dudjom Sangye Pema Shepa visited Mindroling monastery and presided over a practice of the Kagyé Deshek Düpa. Then, he participated to a ceremonies held in Bodhgaya for the fifth anniversary of the passing of Khenpo Jigpen. In the last few years, Dudjom Sangye Pema Shepa has granted several major empowerments, including the ‘Collected Work of Dudjom Lingpa’, and the ‘Collected Works of Dudjom Rinpoche’. ↑ Many materials for this text are extracted from ‘The Seed of Faith’, by Khenpo Tamdin Gyalpo & Translated by Dr. Gyurme Dorje. ↑ Dudjom Sangye Pema Zhepa Rinpoche's final speech after concluding Dudjom Tersar Empowerment at Samye Memorial Monastery in May, 2014. ↑ Rangjung Osel Chöling is the main seat of Garab Dorje Rinpoche. ↑ Bartsham is the seat of Lama Nyingkhula. ↑ Yonphu is the monastery of Lama Karpo, aka Tshewang Dorje (1917-1972), who was one of the most exceptional Dzogchen masters of the 20th century, and a direct student of Tokden Shakya Shri and of Dudjom Rinpoche. He settled in Yongphula, Bhutan, and spread widely the Dudjom Tersar lineage in Bhutan. This page was last edited on 17 September 2018, at 08:49.